The Remix Mini was an inarguable Kickstarter success. The Jide team went looking for just $50,000 and ended up with more than $1.5 million. Beneath the pebble-shaped matte plastic exterior is a 1.2GHz quad-core Allwinner processor, 16GB of storage and 2GB of RAM. Nothing that’s going to blow anyone away, but that’s part of the reason it’s just $70. On the back, there are two USB 2.0 ports, an ethernet port, a HDMI out and a headphone port. However, the real charm of the Remix Mini is the forked Android Remix OS, not the hardware bundle. It’s based on Android 5.1, but brings a whole lot more to the table in terms of traditional desktop use. What this means is that you get a familiar feeling OS, but one that’s far better suited to being a desktop machine than Google’s own Chrome OS. You get access to a number of Remix-specific apps from the Remix Store, but you also have direct access to Google Play to download all the normal apps you’d usually use. Setting up the Remix Mini is simple. Plug in the (provided, but probably too short) HDMI cable, plug in the power and you’re done. You’ll then need to work your way through the set-up process. It went smoothly but did take about 10 – 15 minutes in total through system updates and a few other things. It all worked though, there were no hiccups in the process. In fact, I was surprised to find that I had no problem at all in unplugging the USB adapters for my wireless keyboard and mouse and plugging them straight into the Remix Mini. Again, they worked with no issues at all straight away. The unit doesn’t support 5Ghz WiFi networks and the size adjustments I made during setup to ensure the whole screen was displayed weren’t reflected when it first started up. Even having never used Remix OS, it only took 30 seconds to find the correct option to fix that, though. You’ll need to spend a bit of time deciding which apps you want to install – I’m testing the unit plugged into my TV, so media-related apps might make most sense, but seeing as Jide is touting the Remix Mini as suitable for work too, I decided to write this article on it. You can access all your installed apps in the lower left corner of the taskbar – it’s all very familiar feeling for desktop users. On the right side of the taskbar, you’ll find the time/date, Wi-Fi settings and access to a few other settings. It’s also where you access your notifications. For me to do that, I had to install a whole bunch of apps, including my password maanger, Slack, a photo editor, Google Drive (that one doesn’t come pre-installed – but Mail, YouTube and Chrome do) and a few other things. I also added in the Sonos controller; you need music when you’re working, after all. And Twitter, just in case I felt like I was being too productive. The Sonos controller was the first real issue. While the app installs and works just fine, the way in which it pops up dual room controls to allow you to control volume levels independently seemed to be appearing off-screen somewhere. It still allowed for master volume control of all speakers, so wasn’t a huge problem, but might be a sign that some apps might have a few minor incompatibilities. While writing in a Web browser, downloading and lightly editing photos, and using Slack and Twitter aren’t too demanding, the Mini did still struggle a little when switching between apps. It’s important to stress that they never actually crashed, but the screen did go black a couple of times. A spokesperson for the company told me that the team will be rolling out a software update next week, so there’s clearly still a few little things to work out. It certainly didn’t stop me from getting on with this article though. You can resize each app window to fit multiple side-by-side, or in any other arrangement you might want, just don’t expect everything to happen instantly if you’re running multiple apps and frequently switching between them. Whether or not the Mini makes most sense to you as a work machine or a media player probably dictates where and how you’ll use it, though it’s small enough to carry around with you in a bag if you happened to want a desktop PC you carry around with you. If you’re using it hooked up to a TV, as I am here, you’ll probably want to use it for streaming things like Netflix or Amazon Prime Video. This is where I hit another snag. I’m based in the UK, and the BBC’s iPlayer service and streaming in HD on YouTube worked just fine (it supports displays of up to 4K) but Netflix wouldn’t load any titles. The app loaded fine, the menus loaded fine, episode/movie selection worked fine but it won’t actually connect and stream anything on my Netflix right now. Once again, I don’t expect this to be an issue in the near future, and can’t say if it’s a general issue or one specific to me just yet. For the services that did work, playback worked well – and having a keyboard and mouse attached made it a lot easier than, say, searching a Roku or Amazon TV streaming device via a tiny remote control. I haven’t even considered using it for gaming yet, so we’ll have to see how that pans out in the future. If you’re looking for something to replace your desktop computer, you’re going to have to realign your expectations a little. 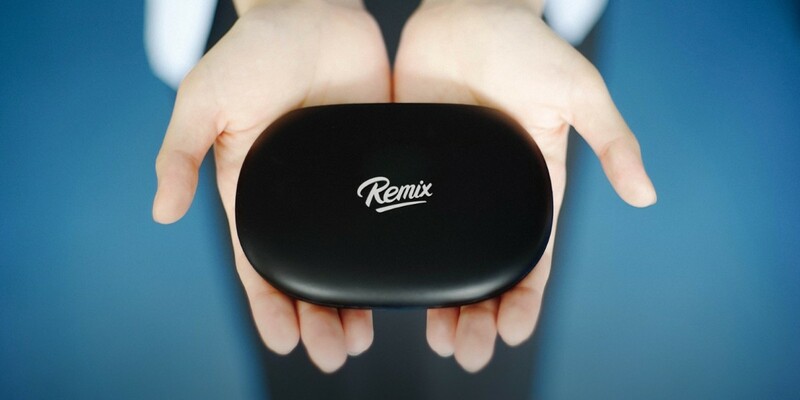 The Remix Mini is a $70 device that arrives ready to go out of the box, with a custom version of Android that works unbelievably well as a ‘desktop’ OS. Finding your way around is intuitive, regardless of which platform you’re coming from – and that’s quite an achievement. It doesn’t make it any less frustrating in those moments when the screen hangs for a second, but just let me repeat, this is essentially a desktop PC you can carry around in your bag with no effort at all. All you need is a screen with an HDMI socket at your destination. It just about escapes this with its logical OS and acceptable hardware performance, though it would perhaps be nice to see a few more features as part of the native OS that are geared towards people who want to use it as a media device primarily. Even without this, you still have access to the whole of Google Play to fulfil your needs, of course. $70 isn’t even a night out. It’s a pizza and a couple of drinks, and for that reason alone, it’s hard to hold the Remix Mini’s foibles against it. Whether or not that value-balanced patience wins out over the frustration in the long-run remains to be seen. It’s available to buy now from Jide’s website for US customers and will be available via Amazon before the end of the week. It’ll be headed to the UK “shortly,” a spokesperson said.